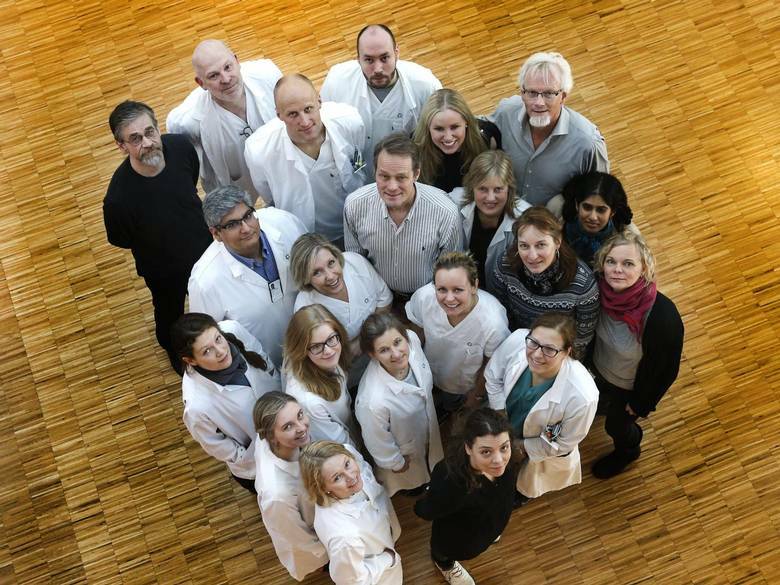 Journalists from Norway's largest newspaper Aftenposten has followed a team of sarcoma researchers at the Norwegian Radium Hospital, OUH, closely for several months. This team, which is led by Ola Myklebost from the Department of Tumor Biology, is working on a unique and ambitious project: map the genes in the tumours from all Norwegian sarcoma patients and compare the results with other cancer forms in order to spot similarities and thereby be able to find more efficient treatments that may help sarcoma patients as well as patients with other rare types for cancer. The article has recently been published as the main feature story in the weekly magazine "A-magasinet", running over 9 pages and entitled "The pursuit of a cancer cure" ("Jakten på en kreftkur"). The Norwegian Sarcoma Consortium - NoSarC - is a sub project under the Norwegian Cancer Genomics Consortium umbrella. The main funding comes from the Norwegian Cancer Society's "Krafttak mot kreft". Home page of Ola Myklebost's research group "Molecular Cancer Biology"